I was not able to find much information on this brewery, but I’ve seen them on the shelves for some time now and they make a gueuze I decided to give them a try. This blended lambic was aged for over three years before being sent out into the world so there in no need to cellar it yourself (unless you want to). Dive right in! Popping the cage and cork released a barrage of sour super funky aromas. Highly acidic. It is a pretty clear beer with a moderate head that looked to be a tad more dense then most gueuze. A slight film of bubbles lasted the entire glass providing some life to the aroma and mouthfeel. Wow! This might be the most sour gueuze I’ve sampled. The aroma alone almost made me pucker. Very fruity indeed, but the hay-like aromas were eclipsed by a sharp Lysol like lemon quality that seemed to even take a backseat to all the sourness going on. Pucking. Each sip brought with it a palate wrecking Warhead-like punch that I could not get use to. My cheeks and far-back sides of my tongue took the hardest hit. Hanssens sure must have some funky yeast and old wooden barrels. Somewhat earthy there is a dry oaky texture and flavor that creates a drying effect on the palate. This served to direct me right back to my drink to quench my palate only to get hit with a sour bomb. 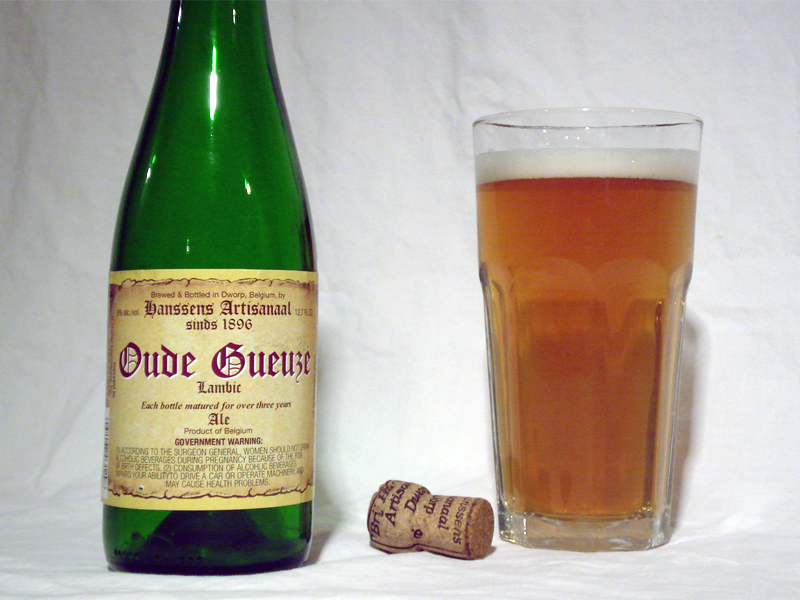 There is also a rather medicinal flavor that I think sets it apart from other gueuze. At the end of the day, I think this one is not as easy sipping or as refreshing due to the intense acidity.